We recently discussed about Pysubd – a free tool that automatically downloads subtitles for multiple video files with a single click. Now what if you have multiple movies files and their subtitle files in a single folder, and you want to arrange the video files and their subtitle files into their separate folders. It will be easy if you have less files but will be very difficult if you have a lot of video files. It will be really hard to make new folders for every file and then move the files into their folder. 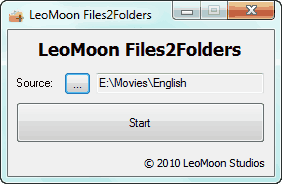 Here comes LeoMoon Files2Folders, a free application that creates a folder for every file (with a unique name) it encounters and put those files into their respective folders. Because subtitle files have the same name as the media file, and there can be no two folders with the same name in a directory, so this application puts the media file and its subtitle file into the same directory. In this way you can easily manage your movies collection automatically. You can download the application for free from here. The file you download is a zip file and can be extracted using any application like WinRAR. The executable file needs only the path to the folder where your media files are. Click the start button after adding the path and within seconds you will get the success message.